iAdopt for the Holidays is in full swing and close to 1,000 animals have been adopted from Ontario SPCA animal centres since this adoption event began on Nov. 1. But there are still animals waiting to find their forever home this holiday season. Could it be yours? Until Dec. 31, the Ontario SPCA, as well as SPCAs, Humane Societies and Animal Welfare groups across Canada are encouraging people to choose pet adoption as their first option when bringing home a new family member. Be sure to visit your local participating society to take part in iAdopt for the Holidays and change an animal’s life this holiday season. During the campaign period, all cats and kittens at Ontario SPCA animal centres are available for adoption for only $99. To further help our feline friends find a home, from Dec. 16-18 adoption fees will be lowered to $25 for all cats at Ontario SPCA animal centres. Find the perfect gift for that animal lover on your list this holiday season with Paws & Give™, the Ontario SPCA’s virtual giving catalogue. 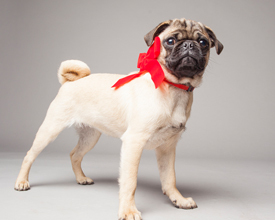 Gift givers can select from a variety of gifts to help animals in need. Young animal lovers can “adopt” their very own pet through the Rocky & Friends line of plush animals modelled after real animals that have come through the Society. Other must-have holiday items include our 2017 Second Chances calendar and animal themed holiday cards. There are also a number of symbolic gifts that are available throughout the year to help the many animals that come into the care of the Ontario SPCA. For example, purchase “Toys for a Shelter Pet” for a friend or loved one and they’ll receive a card notifying them of the gift made in their name. This holiday season give the gift that gives back. Donor generosity has changed the lives of so many animals this year, but there’s still work to be done. Our animal cruelty hotline will continue to receive calls throughout the holiday season, with our inspectorate on call and ready to respond 24/7. As the year comes to a close, there are also many animals that remain in our care. Please make your year-end gift now and change the life of an animal in your community! Gifts received or postmarked before midnight on Dec. 31 are eligible for a 2016 tax receipt, but the fastest way to receive your tax receipt is to donate online now. On behalf of our animal care workers, agents, inspectors and volunteers, thank you from the bottom of our hearts. Please take a minute to watch a short video about why donor support means so much to Iris, a volunteer who has been helping animals for almost two years. Save the date for a sweet treat! Preheat those ovens! 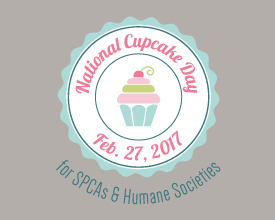 National Cupcake Day™ in Support of Humane Societies and SPCA’s across Canada is back. Register for National Cupcake Day and host your own Cupcake Day party where you bake cupcakes for your co-workers, friends and family. Your guests donate to the participating animal welfare charity of your choice in exchange for a cupcake. The event provides critically-needed funds for animals that are abused, abandoned, neglected or no longer wanted. Your Cupcake Day party can be held at your workplace, home, school or local community centre – anywhere where you think people will enjoy a treat! Visit nationalcupcakeday.ca to register, bake and donate. Help “bake” a difference for animals’ in need. The countdown to National Cupcake Day on Feb. 27 is on! The Ontario SPCA would like to wish you a safe and happy holiday season with your two and four-legged friends and family members! Normal hours of operation will resume on Tuesday, Jan. 3. The Ontario SPCA is honoured to have received a very prestigious award from the Chatham-Kent Police. Chief Gary Conn of the Chatham-Kent Police recognized the Ontario SPCA’s Major Case Management Team with a Chief’s Commendation Award for their assistance breaking a major dog fighting operation in Tilbury, ON. As part of a Joint Forces Operation in October 2015, members of the Ontario SPCA Major Case Management Team and the Chatham-Kent Police Service Intelligence Unit, Critical Incident Response Team, Forensic Identification Unit, Major Crime Section and Community Patrol Branch executed multiple warrants at a residence in Tilbury East Township. As a result, five people were charged by the Chatham-Kent Police Service for animal cruelty and firearm related offences under the Criminal Code of Canada. 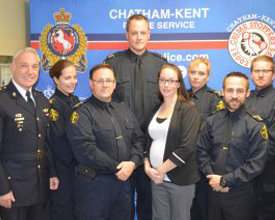 To commend the Ontario SPCA’s Major Case Management Team for the actions, tenacity and dedicated teamwork its members exhibited throughout the investigation, the Chatham-Kent Police presented these highly trained officers with a Chief’s Commendation during a ceremony on Nov. 15, 2016. Thanks to committed volunteers and generous sponsors, feral cats will be warm and well fed this winter. Through one of the Ontario SPCA’s feral cat programs, over 240 shelters were built this year. Made by volunteers, these shelters are available to caretakers of feral cat colonies to provide a safe, warm place for their colonies during our cold, harsh winters. Special thanks to Wright Brothers Hay and Straw of Queensville, ON. for donating approximately 125 bales of straw, which is used as insulation. 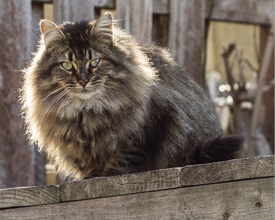 The Ontario SPCA also operates a free feral cat food bank to provide a sustainable support of food to the caretakers of feral cat colonies. In addition to donations of cat food received by generous members of the public, LifeCorps Food Share in Richmond Hill has donated and delivered hundreds of pounds of cat food monthly for the past year. Thanks to their contributions, the food bank has been kept well stocked.